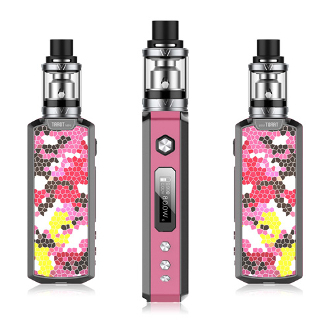 Vaporesso Tarot Mini Kit has kept the enchanting and wowza design of the tarot nano family, but with a bigger interface for easier use and precision. It keeps with most of the same features including the ability to switch modes: VW/TC/TCR/CCW/CCT. While bigger than the Nano Kits, the Tarot Mini is still... well mini. Its a great size that allows you to fit your own 18650 battery while maintaining a carry around light weight body. The Tarot Mini comes with a Veco tank which has a top fill feature and of course the revolutionary EUC coil for an easy in and out coil change. The kit comes with a 0.4 and 0.5 ohm coil. The comfortably low ohm and the Tarot Mini Mod's 5-80W output gives the user a super satisfying and super cute way to vape!